In the United States today, more than 50% of households are headed by individuals over the age of 50. A recent study by the Harvard Joint Center for Housing Studies found this to be in large part due to an increase in baby boomer households, those aged 65-74. Between 2011 and 2016, they grew to over 17 million households. In addition, the study estimated that the number of households headed by individuals over 80 years old will more than double by 2037. 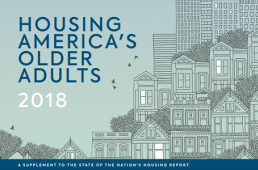 Focusing on households over 50 and looking at several factors including demographics, financials and geography, the study highlighted the following about the state of housing for older Americans. They are burdened by the heavy cost of housing. Nearly a third of households over 65 pay at least 30 percent of their income on housing and more than half of those pay over 50%. Between 2011 and 2016, incomes rose by 9.6% for baby boomers and 5.2% for those over 80. By contrast, incomes rose by only 2.6% for those aged 50-64. Historically, there has always been a large gap in homeownership rates for older white Americans and older black Americans. 81% of white households over 50 years old own their homes, compared to only 57% of older black households. This gap is the largest recorded since 1976, when trends started to be tracked. More are living in low-density census tracts. The number of older adults living in low-density census tracts increased by 6 million between 2000 and 2016. Services and transportation alternatives are more difficult to provide in low-density areas where housing is more spread apart. There aren’t enough accessible units available. In 2016, 17 percent of households over 50 included someone with mobility difficulties and according to recent estimates only 3.5% of housing units in the United States had key features to address those mobility issues. Many older Americans live alone. 57% of households over 80 are single person households. 77% of rental households over 80 are single person households. These households tend to have lower incomes and when support or care is needed, they must rely on someone for help that’s not living in the home. The study warns that as the number of older households increases, there will be a greater need for supportive and accessible housing and that isn’t currently available. The study concludes that a coordinated effort will be needed to solve the issues facing older households in America. More info can be found in the press release here. On the House blog posts are meant to provide general information on various housing-related issues, research and programs. We are not liable for any errors or inaccuracies in the information provided by blog sources. Furthermore, this blog is not legal advice and should not be used as a substitute for legal advice from a licensed professional attorney. I am a senior who has been uniquely affect by a lodging squeeze. For the past 6 years my residence has been independent senior facilities. Four years was spent in a +55 apartment building. Three years ago developers acquired the property. A complete renovation was initiated and seniors vacated the property. The apartment building is now a market rate residence. Economics required a move to a retirement community’ Two years thereafter developers bought the retirement complex. As a 73 year old senior I’m experiencing difficulty in locating moderately price housing in North Dallas. Leaving the state of Texas is becoming a viable option. TSAHC reviews all blog comments before they are posted to ensure a positive experience for our online community. Off-topic comments; hostile, derogatory or deliberately insulting comments; and comments specifically promoting goods and services will not be posted. For more information, please see our Comment Posting Guidelines.